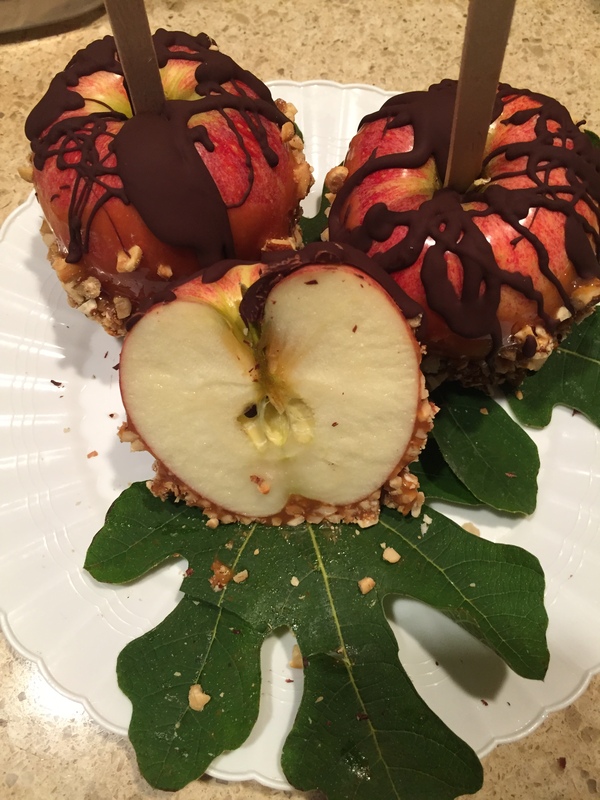 Caramel Apples with Nuts and Chocolate | Does This Font Make Me Look Fat? We have new next door neighbors. The house had been a rental for the eleven years we’ve lived here and it’s wonderful to see this couple dig in to make it their own. One of the first things they did was remove a row of Leland Cyprus along their back fence. That will give me some much needed sun in a back section of my garden although I will no longer be able to cut cyprus branches from the back of that hedgerow to use in my winter windowboxes. This weekend the neighbors borrowed our chop saw for two days and this is what they brought over to say thank you. The presentation was incredible and the caramel apples are fantastic. Kerry and Renee – you can borrow our tools anytime. I liked the Halloween color contrast between the colorful apples, the chocolate and the caramel. I guess you can get these clear cellophane bags at the craft store. I’m lucky if I get cookies for a neighbor on a paper plate and covered with Saran. I really should try to do this better. I cut the apples into slices so they would be easier to eat, although that might have been a BIG mistake. Here’s the recipe as best I could figure it out from my neighbor’s description. I think she’s one of those cooks who doesn’t always follow a recipe. Remove the stem from each apple and press a craft stick into the top. Butter a parchment covered baking sheet.Place caramels and milk in a microwave safe bowl, and microwave 2 minutes, stirring once. Or melt caramels slowly on stove top. Allow to cool briefly. Roll each apple quickly in caramel sauce until well coated. Place on prepared baking sheet to set. Place in refrigerator to cool. Before caramel becomes totally cold, roll in chopped salted mixed nuts. Return to fridge to cool. Melt dark chocolate and drizzle over apples. Store in refrigerator. 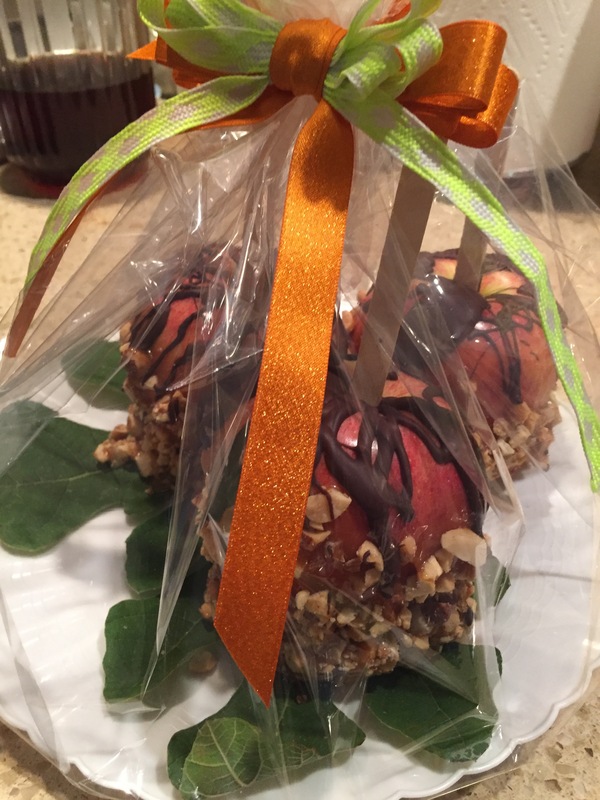 This entry was posted in Foodie, Uncategorized and tagged Borrowing Tools, caramel apples, Halloween, Halloween candy apples, New Neighbors by Mala Burt. Bookmark the permalink.